‘Red car, red car” Little B shouts excitedly as we set off to the park. I feel a glowing pride at our boy’s developing understanding of the world. How does he know it’s red? A-maazing. “Red car, red CARRRRRRR!” he screeches again. OK. We clearly have some way to go. So how do children learn what colour is? And how can us parents help them discover this whole new way of categorising the world? I find the underlying concept incredible and baffling. I mean, we never stop to think about it, but what is a colour? I don’t mean in a scientific sense; why things have different colours depending on how they absorb and reflect light. I mean if someone from another planet (a toddler then) asked you what a colour was, what would you say? What is red? It’s completely abstract and also subjective. One red to me might be a dark pink to you. Think about all the arguments about paint colours when you’re decorating. But leaving that to one side I still couldn’t think of a satisfactory way to explain what red was. So naturally I went on t’internet. Here are some things I discovered. For most of human history people didn’t know colour came from light. They thought that the light from the Sun was ‘given by God’ and that light was pure and white. So the assumption was that colours were generated by objects, that plants and flowers emanated green or yellow and so on. It wasn’t until 1672 when Sir Isaac Newton stuck a bodkin in his eye to discover whether the colour was in his head or in the world that anyone really tried to work this out. He managed not to blind himself but I wouldn’t recommend doing this. What you can do is what clever Sir Isaac did next. He got hold of a prism (a rare object at the time), placed it in his laboratory, popped a hole in the window blind, and waited for the sun to strike the prism at just the right angle. When the sun struck the prism Sir Isaac wrote that he saw ‘a coloured image of the sun’ projected from the glass. However, he still wasn’t sure whether the colour was coming from the prism; whether something in the glass was muddying the white light. Sir Isaac wasn’t a quitter so he got a second prism and held it in the blue light. Would it add even more colours? Nothing happened – it stayed blue. From this he deduced that the colours were within the white light from the Sun. Not coming from inside the prism. This led to Sir Isaac Newton writing down the colour spectrum – the famous rainbow of colours that I remember reciting at school; red, orange, yellow, green, blue, indigo, and violet. Of course, this isn’t to say that people weren’t aware of colour or that they didn’t see it prior to this time. But there is some evidence to suggest that ancient civilisations didn’t see colour in the way we do. How do we know this? Because they didn’t always have words for it. In Ancient Greek, Hebrew, Chinese, and Japanese there is no word for blue. William Gladstone, who later became Prime Minister, clearly had some time on his hands in 1858 because he went through Homer’s The Odyssey and noted down all the references to colour. See what people used to get done before social media and cat videos? Gladstone worked out that red is mentioned fewer than 15 times, and yellow and green fewer than 10. It seemed that the Ancient Greeks lived in a murky world of browns and blacks, whites with occasional flashes of colour. The pattern was later found to be repeated around the world by Lazarus Geiger who noticed that languages had developed words for colours in a similar order. And everywhere he looked there was no word for blue until relatively recently in history. The only ancient culture to develop a word for blue were the Egyptians — and as it happens, they were also the only ancient civilisation that had a way to produce a blue dye. So depending on which part of the world you were from, and whether colour was an important part of your daily life, you might not have paid much attention to it. And this begs the question, do you actually see the colour? If you’re screaming “Yes, of course you see it you idiot” hold that thought and I’ll come back to you with a little experiment at the end of the post. When do children first see colour? It’s often said that babies can only see in black and white when they’re born. Actually, their eyes are physically capable of seeing colour – all the bells and whistles are in place in the retina – but experiments show that they don’t pay much attention to colour. Hence the baby books that have high contrast black and white images. Scientists think this is because newborns are focused (in every sense) on their parents faces and important things like breasts or bottles of milk. So they concentrate on patterns and shapes before getting to grips with colours later. By six months your baby’s vision should be well-developed and they will be interested in brightly coloured toys, flowers, and food. So as you’re going about your day together you can start naming colours. And from year on they may start to play with crayons, which can be a great time to start talking about colours, even if they can’t talk back to you just yet. A key developmental leap occurs around 18 months when toddlers start to put things into categories – the same time they begin to notice similarities and differences in shape, size, hard and soft. They are constantly looking for clues that tell them this thing is a bit like that thing. Until this kicks in every object in the world is unique as far they are concerned. But they are listening to us and noticing that we use the same words in relation to lots of different things. So how can you teach toddlers colour? The obvious answer is to use the seven basic colour words in your day-to-day chat with your child. The trick is finding ways to help them understand what ‘red’ refers to and to differentiate between the words. Mealtimes – you could talk about the different coloured food on their plate. Red and yellow peppers, green broccoli, yellow banana. And if fruit and veg are proving tricky you can also get coloured pasta. Drawing and painting – an obvious one but it’s easy to let them scribble and comment on the colours. “Is that a cat? Lovely, a blue cat.” And so on. Blocks and pots – we’ve got a multi-coloured stack of pots that Little B can put inside each other and hopefully one day build a tower with. It’s a simple step to talk about the red pot going in the yellow pot as he tries out different combinations. Reading books – there are lots of brilliant books but Elmer’s Colours is one I loved when I was little or Maisy’s First Colours. Make a collage – like these ones! By grouping together things that are red or green or yellow you can sit together and point out each object, using the colour word as a separate identifier. It’s going to work best with objects that your toddler is already familiar with. Start by letting your toddler find things – it’ll be much more fun for you both! For example, ask him to show you a yellow flower, then let him point to it. You can play similar games when you’re out and about. Say, “Can you see a red car?” then wait a minute to see if she points to it first. She may surprise you by knowing colours, even if she can’t say the words. Keep it fun and don’t expect rapid advances. Learning colours can take a long time. When should children know their colours? Obviously this is going to depend on your child and I am not a fan of being competitive about early development. When it comes to colour, it is as discussed, a complex concept to grasp and even by the age of three many children will still confuse their colours. This can lead to some parents worrying that their child may be colour blind. Some researchers at Stanford University in 2010 found that learning colours appears to be one of the most difficult tasks to master. And they also worked out that the key to teaching them was as simple as changing where the colour word came in a sentence. Whenever a toddler hears “red” or “blue” they can probably see lots of other colours around to confuse the issue. It makes it hard for them to sort the shades. It’s a lot easier to work out the things that have ‘dogness’ or ‘bearness’ than redness. Colours don’t have ears or legs unfortunately. The most useful nugget from their findings is that when talking to a child about colour it’s better to say ‘The car that is red’ rather than saying ‘The red car’. Why? Because young children need to learn that some words are properties of an object, not names. Divorced from context, most two and three-year olds might as well be colorblind; certainly they look that way when asked to correctly identify colors in a line-up, or accurately use color words in novel contexts…even after hours and hours of repeated training on color words, children’s performance typically fails to noticeably improve, and children as old as six continue to make major color naming errors. If we say “look at the red car” it sounds like that’s the name of the object. The trick is to separate the red quality from the noun. When I realised this it made a lot more sense why Little B now calls all cars ‘red car’. He’s picked up on one word that we’ve used and decided that’s the name to use for all car-shaped things. By putting the colour after the noun – ‘Here is a car, it’s red’ – you will have helped to define “redness” as an attribute of the car. This helps the child work out what about the car makes it red. This has actually made my head hurt trying to think about this like a toddler would, but if you really want to dig into the theory about this the full Stanford research is here. So as promised, here’s a fascinating conundrum to end on. Is colour in the world or in our heads? When researcher Jules Davidoff showed some Himba volunteers a circle of green squares with one blue square they couldn’t tell which one was the odd one out. 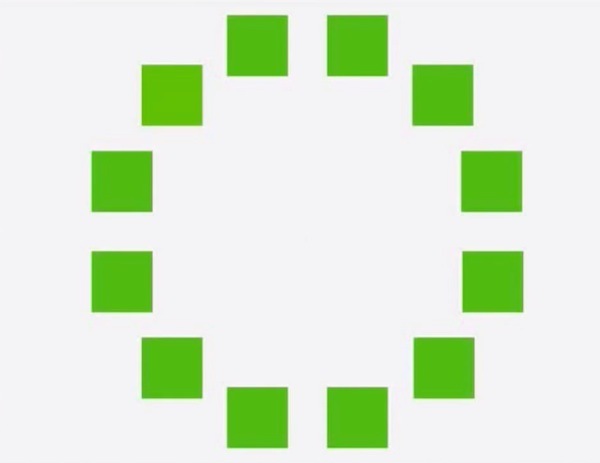 However, they could spot the odd one out in a circle of green squares, which look almost identical to us. Can’t spot it? Me neither. But the Himba people see it instantly. Apparently it’s the square at the one o clock position. So if you don’t have a word for a colour – can you actually see the colour? Hopefully, it won’t be this hard to teach your toddler some colours! This is an awesome post! Colours have always fascinated me and been mind boggling at the same time and you have described the world of colour so well! Just starting to teach my girls colour now and for a while everything was yellow, I think because they associated the word colour with the first colour we tried to teach them! Some great ideas for ways to teach and also thanks for the tip on separating the noun and the colour, I didn’t know about that. Thanks. I find all the development stuff fascinating. It makes you unpick how your own brain works and question your perception of the world that as adults we take for granted!